Last week, actor Josh Gad posted a hilarious video from the set of the movie he's currently filming, director Kenneth Branagh's remake of Murder on the Orient Express. The video didn't reveal anything from that film, but it did show Josh Gad's unscrupulous attempt to pry any details about Star Wars: The Last Jedi from his co-star, Daisy Ridley. Despite failing in his first attempt, Josh Gad has given his quest for Star Wars 8 spoilers another try with another hilarious video, as he tries a somewhat different approach. Josh Gad posted the first video on Instagram last week, where he asked the Star Wars 8 star into his trailer, under the guise of asking her questions about the scene they're about to shoot. Instead, he bombarded her with questions pertaining to Star Wars, including, 'Who is The Last Jedi?' and asking if Jedi is actually plural, meaning it could be more than one character who is the Last Jedi. He continued to badger his co-star, asking if her character Rey was a Jedi, which resulted in her walking out. The actor posted a new video on Facebook, where he attempts to apologize for last week's incident, although it quickly veers into familiar territory. Here's what he had to say in the caption of his Facebook video. "Had a follow-up conversation with Daisy Ridley on set today. Tried to apologize for #StarWars #TheLastJedi sneak attack last week. Suffice it to say, it didn't go well." This video starts with Josh Gad apologizing to his co-star, who revealed that some people online thought she was "super angry" although she wasn't, but she did add that it was uncomfortable. 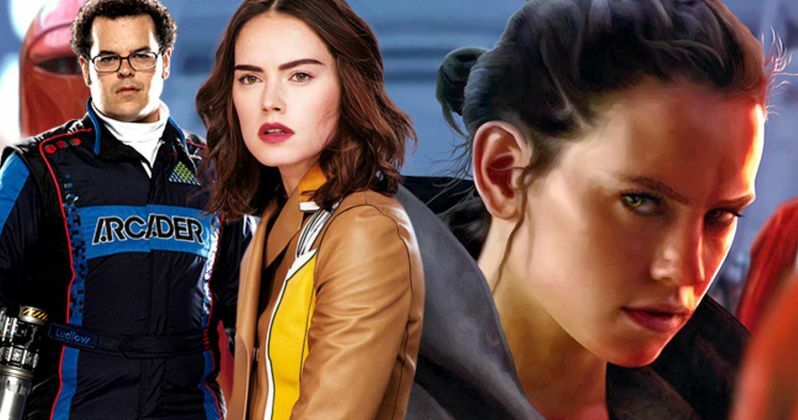 This time around, Josh Gad presents Daisy Ridley with a script that features new dialogue Murder on the Orient Express director Kenneth Branagh has reportedly written, and wants them to go over together. One of the lines Daisy has to say is, "You're not asking the right questions," which leads to Josh Gad's second round of The Last Jedi questions that Daisy Ridley's character is supposed to say in this "script," including, 'Who are Rey's parents?" "Am I a Jedi?" "Is Finn paralyzed from the waist down?" The script then directs Daisy Ridley to "answer honestly," which leads the actress to walk out again, without revealing a thing. The Finn rumor is certainly a new one, but there has been plenty of speculation about what happened to John Boyega's beloved character. When we last saw Finn, he was lying unconscious on a table, having been injured during his lightsaber battle with Kylo Ren (Adam Driver). Still, it seems unlikely that Finn is paralyzed, since John Boyega stated in an interview that his role will be "much more physical" in Star Wars 8, teasing that he will have to hit the gym more. We've also seen set images where he is riding a 'space horse', and he appeared to be in fine physical shape. As for the other questions posed by Josh Gad, they are among the most important questions that need to be answered at some point in this new trilogy. While Disney hasn't released an official plot rundown at this time, we know the story takes place directly after the end of Star Wars: The Force Awakens, where Daisy Ridley's Rey finally meets Mark Hamill's Luke Skywalker, returning his lightsaber on the hidden planet of Ahch-To. There have long been rumors that Star Wars: The Last Jedi will follow Rey's Jedi training with Luke Skywalker, although it is believed that she will abandon her training upon learning that her friends Finn and Poe Dameron (Oscar Isaac) are captured by Kylo Ren, mirroring Luke Skywalker's same decision to leave in the midst of his training to help his friends. Take a look at this new video below, where Josh Gad continues to press Daisy Ridley for any spoilers regarding Star Wars: The Last Jedi.